June 2010 Temperature Update: 8th Warmest in U.S. The National Climatic Data Center (NCDC) preliminary analysis for June 2010, posted this morning, shows that average temperatures in the U.S. were the 8th warmest in 116 years of records. Out of 9 climatic regions, 3 were much above normal, 2 were above normal, and 3 were near normal. Only the Pacific Northwest was below normal. It was the second warmest on record for the Southeast, 5th warmest for the South, and the 7th warmest for the Central Region. Nearly every state from Texas and Oklahoma eastward to the Atlantic Coast and northward through the Ohio Valley and Mid Atlantic to southern New England had a top 10 warmest June. Oregon and Washington were the only states with below normal temperatures. For the first half of 2010, 4 states (Maine, New Hampshire, Vermont, and Rhode Island) had their warmest January-June. Eight other Northeast and Great Lakes states have had a top-ten first half. Florida had its 7th coolest year to date. A total of 20 states had their warmest or second warmest second quarter. The West and Northwest had below normal to much below normal temperatures. It was the 4th coolest in Oregon and the 11th coolest in Idaho. Periods of record are somewhat shorter for these stations than for many in the Mid Atlantic and Northeast: Seattle Tacoma data began 1945, Olympia 1948, Seattle WFO 1986, Quillayute 1966. July 9 Update: This morning, Mark Haines pointed out that even the one example cited yesterday by the CEI guest was phony (video not available). 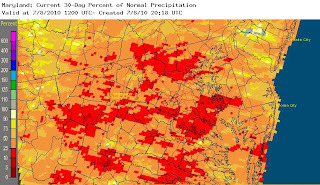 July 10 Update: In a front page article, Baltimore Sun weather reporter Frank Roylance surveys drought impacts on Maryland farms. July 9 Update: WAMU reports on the effects on Northern Virginia farmers. 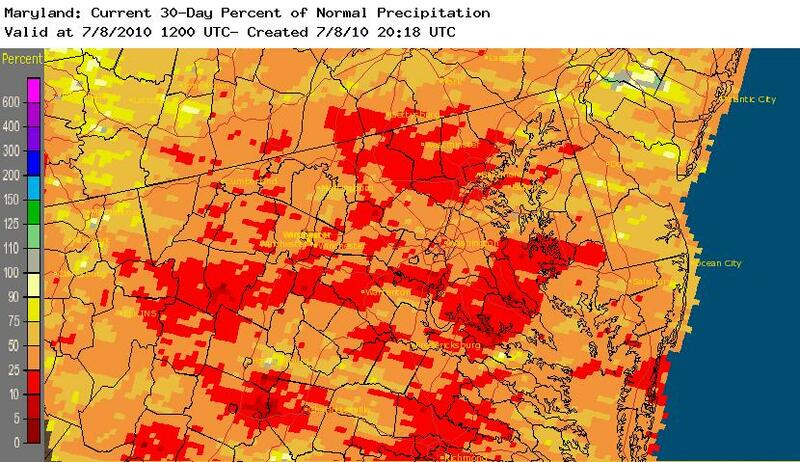 Recent record-breaking temperatures have exacerbated the effects of low precipitation to produce developing drought conditions across much of the DC/Maryland/Virginia region. The latest U.S. Drought Monitor, released this morning, shows over one-third of Virginia, including all of the DC suburban counties other than Loudoun, in the Moderate Drought (D1) category. This is up from less than 1% the previous week. All of the rest of the state, except the far southwest, is at least Abnormally Dry (D0). To the north, conditions are even more dire in Maryland, where over two-thirds of the state is in Moderate Drought (64%) or Severe Drought (4%). Nearly all of central Maryland, southern Maryland, and the lower half of the Eastern Shore are in Moderate or Severe Drought. The Severe area covers a portion of the lower western shore of the Chesapeake Bay. Baltimore City, the District of Columbia, and all of their adjacent counties are in Moderate Drought, except for far western Montgomery County. The map of 30-day precipitation ending this morning shows virtually all of northern Virginia, DC, and Maryland with less than 50% of the normal amount. A substantial portion, probably around 50%, is in the 10-25% range (red area). Midnight Update: Several hours of easterly winds have helped lower the Philadelphia temperature to 80° at midnight. The record does not fall. The low of 80° at Washington, however, appears to be holding for a new daily high minimum (old record 79° in 1999). FROM NOON TO 6 PM EDT. NOON EST...OR 1 PM EDT. BWI AIRPORT FROM 1 PM THROUGH 7 PM EDT. Hourly temperature records extend back to August 1921 in Washington and August 1927 in Baltimore. Another all-time record poised to fall in this heat wave is the highest minimum temperature at Philadelphia. With only 3 hours left to go, the morning low of 83° is still above the previous record of 82° last hit on Aug. 8, 2001. The 10 pm temperature at Philadelphia is 86°. The preliminary highs are not yet in, but the official Washington temperature has reached at least 102°, breaking the old daily record by 3°. The low so far of 80° is also in serious contention for a record high minimum, given the near-zero prospect of any precipitation before midnight. Elsewhere in the region, the current 101° at Dulles is at least a tie, and Baltimore/BWI's 101° beats the record by there by 2°. Baltimore Inner Harbor has also reached at least 101°. Philadelphia has reached at least 102°, which beats the old record by 4°. Records are also tumbling at Allentown, Trenton, and Wilmington DE. Records have also been broken at 5 out of the 6 major climate sites in the New York City region. Bridgeport has at least a tie. The 99° at National is enough to at least tie the 1991 record for the date. Midnight Update: The National Weather Service reports that the Hartford (Bradley Airport), CT record also tied the all-time record for any date on August 9, 2001 and July 3, 1966. Hartford records began in 1905. Additional record report: Blue Hills Observatory MA hit a new daily record of 99° (old record 98°, 1911). 6 PM Update: The high temperature of 105° at Baltimore/BWI broke the old record from 1999 by a very impressive 4°. Baltimore Inner Harbor was also 105°. Baltimore climate records extend back to 1870. The Washington National high of 102° missed the record by 1°, and the 100° at Dulles missed the record there by 2°. Washington National has reached at least 102° at 4 pm. Philadelphia has been at 102° for 2 consecutive hours. Central Park has extended its record to 103°. 3 PM Update: The reported high temperature so far today at Wilmington, Delaware of 103°, if correct, breaks the old daily record from 1999 by the astonishing amount of at least 5°. This is the hottest temperature at Wilmington since July 10, 1936. The record for today was originally broken before noon, and the temperature has continued to rise. Philadelphia has broken the daily record of 98° from 1999 by at least 3°. Atlantic City has also broken its 1999 record of 99° by a comparable amount. The 104° temperature at Baltimore's BWI Airport as of 2 pm has already smashed the record for July 6 set in 1999 by 3°. Baltimore's all-time heat record is 107° set on 7/10/1936. Baltimore's Inner Harbor is also well above the century mark with a high so far of 101°. Washington National's high of 101° so far is still 2° short of the record. Triple digit temperatures extend well into Virginia, with Richmond at 101°. To the north, Philadelphia has hit 101°, Atlantic City 102°, New York's JFK and LaGuardia both 101° (new record at JFK, tie at LaGuardia). The 102° at New York's Central Park has already broken the record for the date (101°, 1999). It didn't set any records in the Washington, DC area today, but the latest round of Heat Wave 2010 has brought back triple digit temperatures. Today's high reached 100° at Baltimore's BWI Airport, just 2° shy of the July 5 daily record set in 1919 and tied in 1999. Washington National was within 3° of the record at 99°, and Washington Dulles hit a milder 96°, also 3° below the record. Richmond was also in triple digits, but the 100° high was 1° lower than the record. Norfolk had a four-way tie with 1990/1980/1957 at 98°. The 97° at Salisbury, MD was 3° short of the 1999 record. Wallops Island, whose record extends only back to 1963, set a record of 98°, beating the 1999 record of 97°. Allentown, PA tied the record of 98° in 1955/1999. Atlantic City, NJ tied the record of 99° in 1999. Georgetown, DE was 1° below the record of 98° in 1949. Philadelphia's 98° was 2° below the 1919/1999 record. Reading, PA tied the 1919/1999 record at 100°. Trenton, NJ was also in triple digits, but the 100° was 2° short of the 1999 record. Central Park, NY missed the century club by 1°, which was 2° short of the 101° record in 1999. Newark, NJ roasted in 102° heat, but that was 1° short of the 1999 record. Also recording near misses were New York's La Guardia (98°) and JFK (97°). Temperatures were in the upper 90s well into New England, where Concord, NH reached 97°, which was 4° short of the record. All six of the individual months were above average. Official records began in Boston in 1872, in Hartford and Providence in 1904, and in Worcester in 1892.